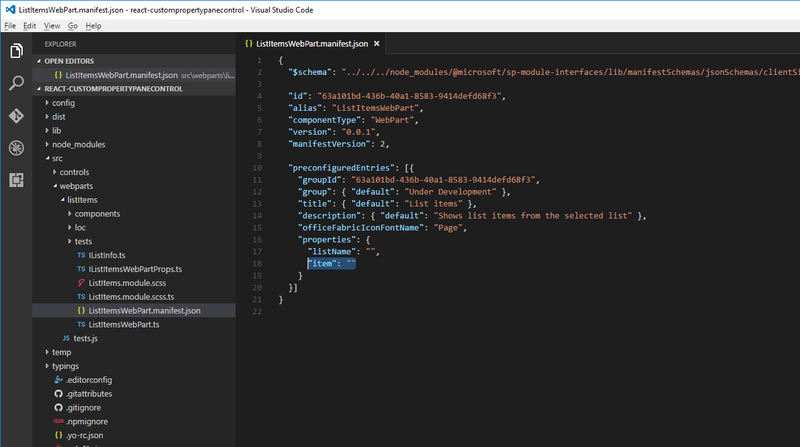 The SharePoint Framework contains a set of standard controls for the property pane. But sometimes you need additional functionality beyond the basic controls. You might need asynchronous updates to the data on a control or a specific user interface. Build a custom control for the property pane to get the functionality you need. In this article, you will build a custom dropdown control that loads its data asynchronously from an external service without blocking the user interface of the web part. The source of the working web part is available on GitHub at sp-dev-fx-webparts/samples/react-custompropertypanecontrols/. 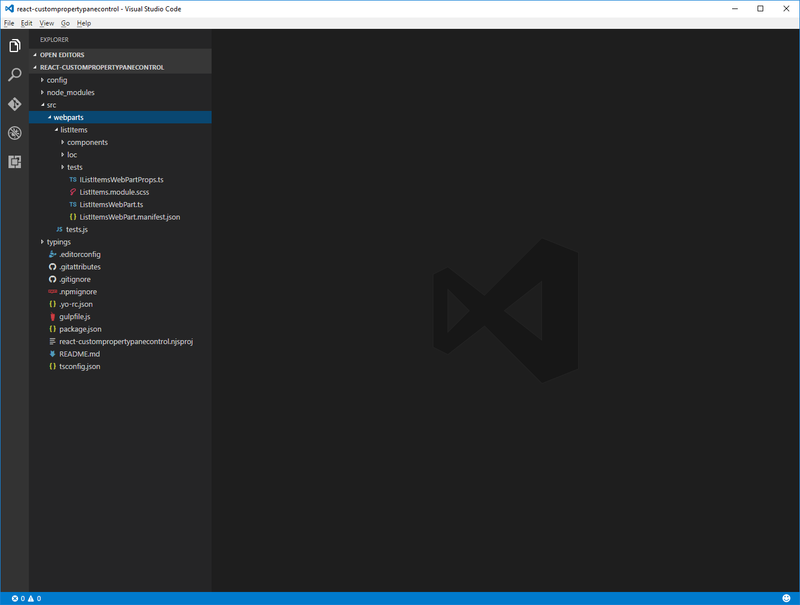 Before following the steps in this article, be sure to set up your development environment for building SharePoint Framework solutions. 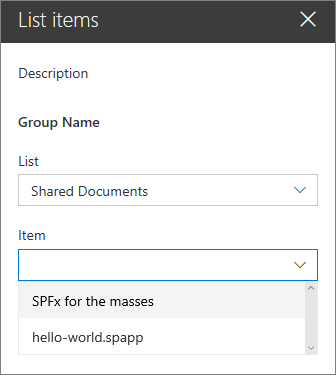 The web part you are building shows list items from the selected SharePoint list. Users are able to select a list in the web part properties. To store the selected list, create a new web part property named listName. In the code editor, open the src/webparts/listItems/ListItemsWebPartManifest.json file. Replace the default description property with a new property named listName. In the src/webparts/listItems/loc/en-us.js file, add the missing definition for the ListFieldLabel string. In the web browser, add the List items web part to the canvas and open its properties. Verify that the value set for the List property is displayed in the web part body. The SharePoint Framework offers you a standard dropdown control that allows users to select a specific value. The dropdown control is built in a way that requires all its values to be known upfront. If you want to load the values dynamically or you're loading values asynchronously from an external service and you don't want to block the whole web part, building a custom dropdown control is a viable option. 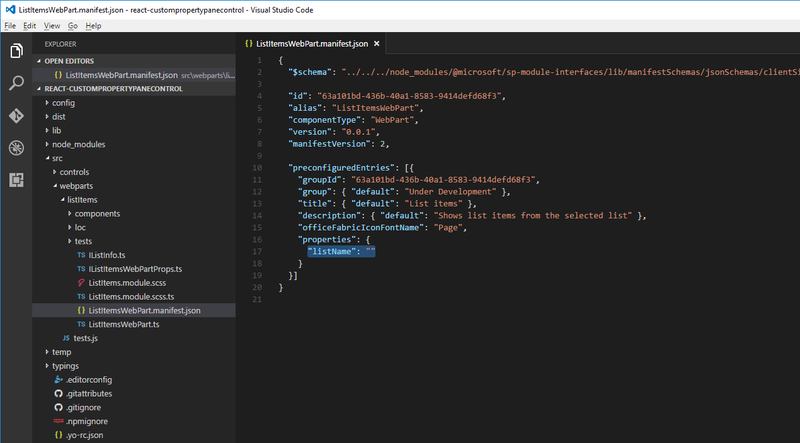 When creating a custom property pane control that uses React in the SharePoint Framework, the control consists of a class that registers the control with the web part, and a React component that renders the dropdown and manages its data. 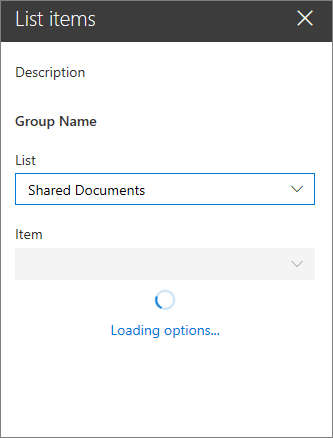 Create the components folder. In the project src folder, create a hierarchy of three new folders so that your folder structure appears as src/controls/PropertyPaneAsyncDropdown/components. The label property specifies the label for the dropdown control. The function associated with the loadOptions delegate is called by the control to load the available options. The function associated with the onChanged delegate is called after the user selects an option in the dropdown. The selectedKey property specifies the selected value, which can be a string or a number. The disabled property specifies if the dropdown control is disabled or not. The stateKey property is used to force the React component to re-render. The loading property determines if the component is loading its options at the given moment. The options property contains all available options. If an error occurred, it is assigned to the error property from where it is communicated to the user. When the component first loads, the componentDidMount method, or its disabled or stateKey properties, change, and it loads the available options by calling the loadOptions method passed through the properties. After the options are loaded, the component updates its state showing the available options. The dropdown itself is rendered by using the Office UI Fabric React dropdown component. When the component is loading the available options, it displays a spinner by using the Office UI Fabric React spinner component. The next step is to define the custom property pane control. This control is used inside the web part when defining properties in the property pane, and renders using the previously defined React component. Define asynchronous dropdown property pane control properties. A custom property pane control has two sets of properties. The first set of properties are exposed publicly and are used to define the web part property inside the web part. These properties are component-specific properties, such as the label displayed next to the control, minimum and maximum values for a spinner, or available options for a dropdown. When defining a custom property pane control, the type describing these properties must be passed as the TProperties type when implementing the IPropertyPaneField<TProperties> interface. The second set of properties are private properties used internally inside the custom property pane control. 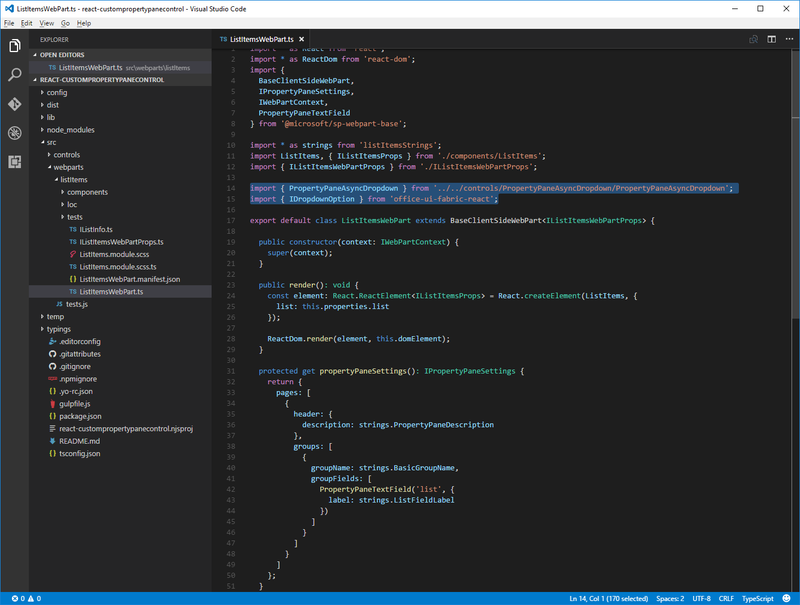 These properties have to adhere to the SharePoint Framework APIs for the custom control to render correctly. These properties must implement the IPropertyPaneCustomFieldProps interface from the **@microsoft/sp-webpart-base** package. The label property defines the label displayed next to the dropdown. The loadOptions delegate defines the method that is called to load the available dropdown options. The onPropertyChange delegate defines a method that is called when the user selects a value in the dropdown. The selectedKey property returns the selected dropdown value. The disabled property specifies whether the control is disabled or not. 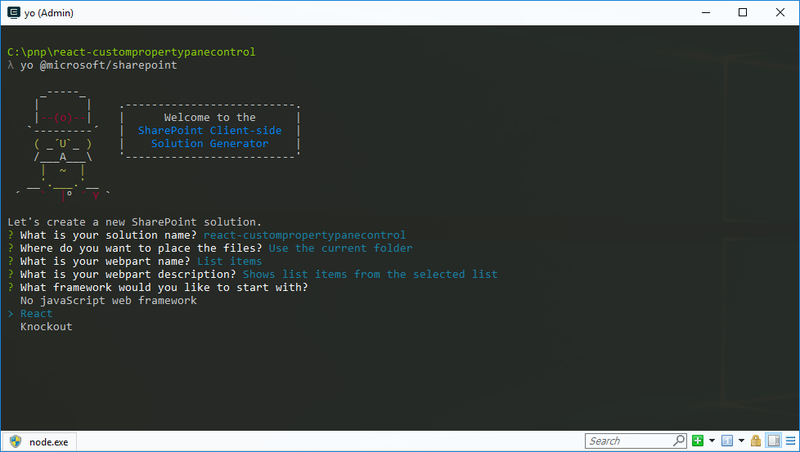 While the IPropertyPaneAsyncDropdownInternalProps interface doesn't define any new properties, it combines the properties from the previously defined IPropertyPaneAsyncDropdownProps interface and the standard SharePoint Framework IPropertyPaneCustomFieldProps interface, which is required for a custom control to run correctly. type: Must be set to PropertyPaneFieldType.Custom for a custom property pane control. targetProperty: Used to specify the name of the web part property to be used with the control. properties: Used to define control-specific properties. Notice how the properties property is of the internal IPropertyPaneAsyncDropdownInternalProps type rather than the public IPropertyPaneAsyncDropdownProps interface implemented by the class. This is on purpose so that the properties property can define the onRender method required by the SharePoint Framework. If the onRender method was a part of the public IPropertyPaneAsyncDropdownProps interface, when using the asynchronous dropdown control in the web part, you would be required to assign a value to it inside the web part, which isn't desirable. The PropertyPaneAsyncDropdown class defines a public render method, which can be used to repaint the control. This is useful in situations such as when you have cascading dropdowns where the value set in one determines the options available in another. By calling the render method after selecting an item, you can have the dependent dropdown load available options. For this to work, you have to make React detect that the control has changed. This is done by setting the value of the stateKey to the current date. Using this trick, every time the onRender method is called, the component not only is re-rendered but also updates its available options. With the asynchronous dropdown property pane control ready, the next step is to use it inside the web part, allowing users to select a list. After that code, add a reference to the IDropdownOption interface and two helpers functions required to work with web part properties. Add method to load available lists. In the ListItemsWebPart class, add a method to load available lists. In this article you use mock data, but you could also call the SharePoint REST API to retrieve the list of available lists from the current web. To simulate loading options from an external service, the method uses a two second delay. Add method to handle the change of the value in the dropdown. In the ListItemsWebPart class, add a new method named onListChange. After selecting a list in the list dropdown, the selected value should be persisted in web part properties, and the web part should be re-rendered to reflect the selected property. Render the list web part property by using the asynchronous dropdown property pane control. In the ListItemsWebPart class, change the getPropertyPaneConfiguration method to use the asynchronous dropdown property pane control to render the listName web part property. When building SharePoint Framework web parts, you might need to implement a configuration where the available options depend on another option chosen previously. A common example is to first let users choose a list and from that list select a list item. The list of available items would depend on the selected list. Here is how to implement such a scenario by using the asynchronous dropdown property pane control implemented in previous steps. In the src/webparts/listItems/ListItemsWebPart.ts file, in the ListItemsWebPart class, add a new method to load available list items from the selected list. Like the method for loading available lists, you use mock data. Depending on the previously selected list, the loadItems method returns mock list items. When no list has been selected, the method resolves the promise without any data. In the ListItemsWebPart class, add a new method named onListItemChange. After selecting an item in the items dropdown, the web part should store the new value in web part properties and re-render the web part to reflect the changes in the user interface. The dropdown for the item property is initialized similarly to the dropdown for the listName property. The only difference is because after selecting a list, the items dropdown has to be refreshed, an instance of the control has to be assigned to the class variable. Initially when no list is selected, the items dropdown is disabled and becomes enabled after the user selects a list. After selecting a list, the items dropdown also loads list items from that list. After selecting a list, the selected item is reset, persisted in web part properties, and reset in the items dropdown. The dropdown for selecting an item becomes enabled, and the dropdown is refreshed in order to load its options. After adding the web part to the page for the first time and opening its property pane, you should see both dropdowns disabled and loading their options. After the options have been loaded, the list dropdown becomes enabled. Because no list has been selected yet, the item dropdown remains disabled. After selecting a list in the list dropdown the item dropdown will load items available in that list. After the available items have been loaded, the item dropdown becomes enabled. After selecting an item in the item dropdown the web part is refreshed showing the selected item in its body.